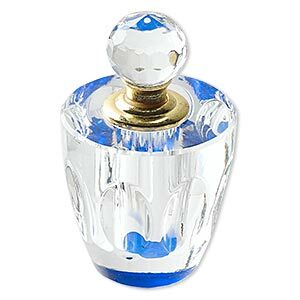 Perfume bottle, glass and gold-finished pewter (tin-based alloy), blue and clear, 2-1/2 x 2-1/2 x 2-1/4 inches with glass dauber. Sold individually. Item Number: H20-2791GF Have a question about this item? 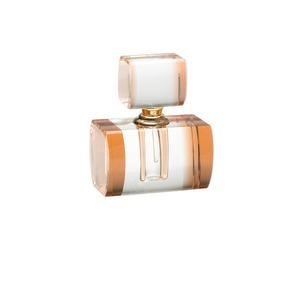 Exquisite perfume bottle crafted from heavy glass is a lovely addition to collections and complements any décor. 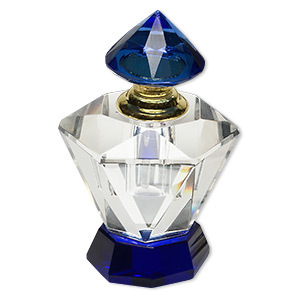 The faceted bottle has gold-finished accents and a threaded glass dauber. Both a beautiful decanter for the collector and a striking display for perfume or essential oil. Alcohol-based perfumes or liquids may cause the adhesive used on the bottles to dissolve. Colors, shapes and sizes may vary in each lot. 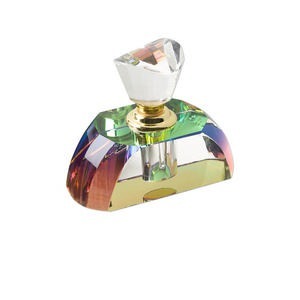 Perfume bottle, glass and gold-finished pewter (tin-based alloy), peach and clear, 3 x 2-1/2 x 1-1/2 inches with glass dauber. Sold individually. 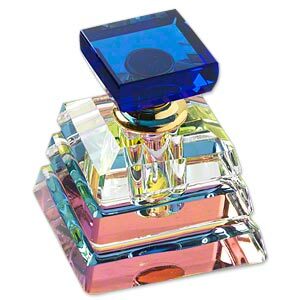 Perfume bottle, glass and gold-finished pewter (tin-based alloy), cobalt and clear, 3-1/4 x 2 x 2 inches with glass dauber. Sold individually. 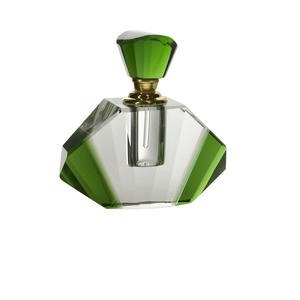 Perfume bottle, glass and gold-finished pewter (tin-based alloy), green and clear, 3-1/4 x 3-1/4 x 1-1/4 inches with glass dauber. Sold individually. 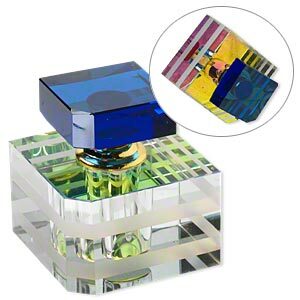 Perfume bottle, glass and gold-finished "pewter" (zinc-based alloy), clear vitrail and cobalt, 2-1/4 x 2 x 2 inches. Sold individually. 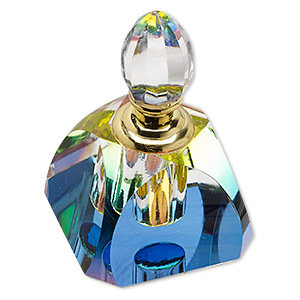 Perfume bottle, glass and gold-finished "pewter" (zinc-based alloy), clear and blue, 2-1/2 x 1-1/2 x 1-1/2 inches with dauber and threaded stopper. Sold individually. 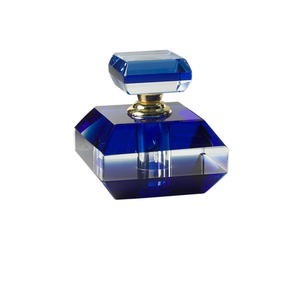 Perfume bottle, glass and gold-finished "pewter" (zinc-based alloy), clear vitrail and cobalt, 2 x 1-3/4 x 1-3/4 inches. Sold individually. 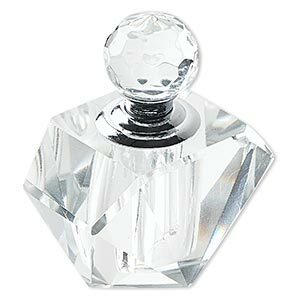 Perfume bottle, glass and silver-finished "pewter" (zinc-based alloy), clear, 2-1/2 x 2 x 2 inches with dauber and threaded stopper. Sold individually. Perfume bottle, glass and gold-finished "pewter" (zinc-based alloy), clear vitrail, 3 x 2-1/4 x 2-1/4 inches. Sold individually. 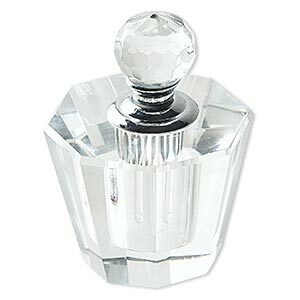 Perfume bottle, glass and gold-finished "pewter" (zinc-based alloy), clear vitrail, 2-3/4 x 2-1/4 x 1-1/2 inches. Sold individually.